British seaside towns are often associated with retirement and the idea of a “last resort“. 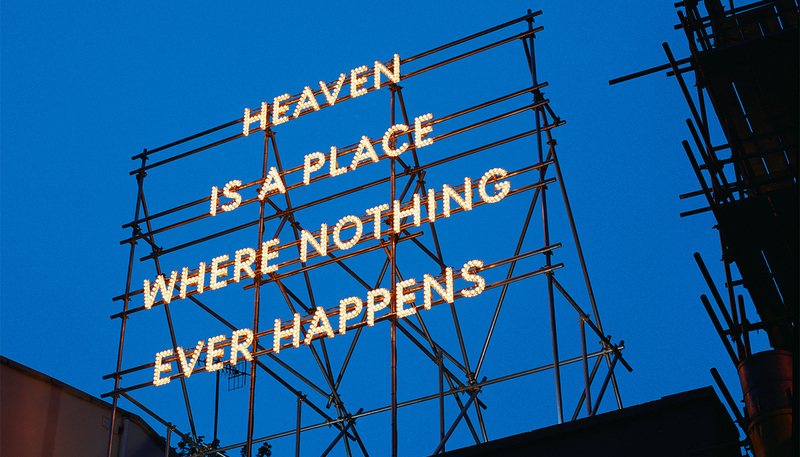 The melancholy of these locations is touched upon by Nathan Coley’s illuminated text sculpture, Heaven Is A Place Where Nothing Ever Happens, seen against the sky in Tontine Street. While formally – ‘written in lights’– suggesting an expectation of excitement, the words communicate more about any seaside towns’ sense of ennui. At once elegant and tacky, the use of white electric lightbulbs evokes 1970s disco glamour as well as fairground aesthetics. Beaming down on Tontine Street from the roof of the old post office, the statement “Heaven is a place where nothing ever happens” could provoke a different reaction in all of us. To some for instance, it could suggest that an afterlife in heaven could be endlessly boring, so maybe it’s a devilish attempt to entice us to spend forever after in the underworld. To others it could cast doubt on the existence of an afterlife at all. Or since Folkestone is a very popular spot for quiet retirement, it could be suggesting that heaven, that final resting place, is the town itself.